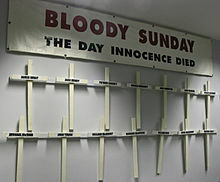 Is éard a bhí i gceist le Domhnach na Fola (Bloody Sunday sa Bhéarla) ná eachtra nó dúnmharú a tharla i nDoire i dTuaisceart Éireann ar an 30 Eanáir, 1972. Lámhaigh saighdiúirí de chuid na Breataine 26 duine agus iad ag máirseáil i dTaobh an Phortaigh, ar son chearta sibhialta. Cailleadh 14 de na daoine seo. Cathlán den Parachute Regiment faoin Leifteanant-choirnéal Derek Wilford agus an Captaen Mike Jackson a bhí i mbun na hoibríochta seo. Fuair triúr déag bás (seisear dóibh faoi ocht mbliana déag d'aois), ar an bpointe, agus duine eile 4½ mí níos déanaí de bharr a bheith gortaithe ar an lá seo. Gortaíodh beirt agóidigh nuair a bhuail gluaisteáin de chuid an airm iad. Is soiléir inniu nach raibh airm ar bith ag éinne de na 26 duine nuair a scaoileadh leo. Piléir sa droim a ghortaigh cúigear díobh. Fiosrúchán Widgery, foilsithe ar 19 Aibréain 1972: dúirt Widgery go raibh na saighdiúirí neamhchiontach. Níor thug mórán daoine meas air, agus mar sin, tharraing an tuarascáil go leor conspóide ar feadh na bilianta. Fiosrúchán Saville; 1998 - 2010: dúirt go raibh siad ciontach. Ghlac rialtas na Breataine leis an toradh seo. Íocadh pacáiste cúitimh. Ar an 18 Nollaig 1974, shocraigh Rialtas na Breataine £42,000 a íoc le muintir an 13. Dhá bhliain roimhe seo a thosaigh feachtas na Sealadach ach tháinig borradh agus fás air mar thoradh ar eachtraí an lae seo. Tá Domhnach na Fola ar ceann de na heachtraí is tábhachtaí i stair na dna Trioblóidí i dTuaisceart Éireann: anois bhí arm na Breataine páirteach sna heachtraí agus fuair muintir na tíre amach faoin eachtra go héasca tríd na meán chumarsáide. Tugadh an leathanach seo cothrom le dáta an 29 Eanáir 2018 ag 23:19.